Yesterday (Wednesday), I tried to post something new, but the Internet was very, very slow, which happens a lot around here especially in the late afternoon. Anyway, tonight things seem to be working well. On Monday morning, we decided to hike up the road a bit and we kept walking up and up and up…all the way to our lot! It was quite a hike. The photo at the top of our blog is the view from our lot. It’s even more gorgeous in person. Round trip our walk took about an hour and a half. It’s a very steep road! 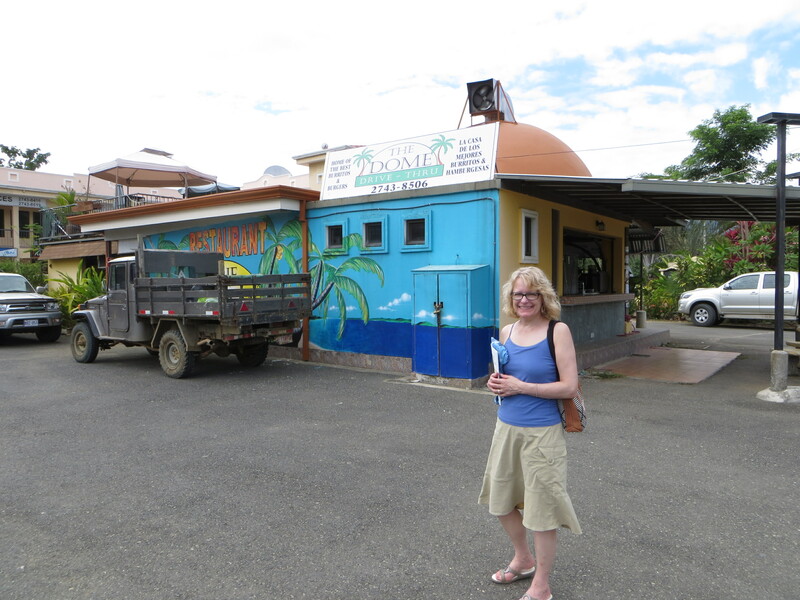 In the afternoon, we decided to drive to a little town called Uvita where there are two grocery stores…more like little markets. You can find the basic essentials there. We had lunch at the Dome restaurant before shopping and that was quite nice. We arrive back home with enough food to last a couple of days. Later that afternoon Mimo, a friend of our caretaker, arrived for a visit. Turns out he is a tour guide who does a little bit of everything and knows many people including a builder friend of Lopez. 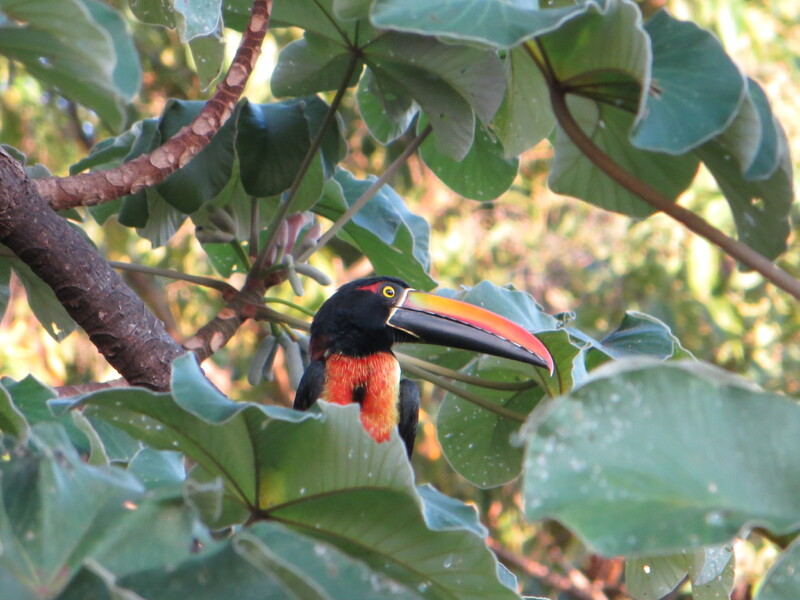 The builder is Costa Rican and only speaks Spanish, but we agreed to meet with him the following morning. Lopez has known Mimo for many years and Mimo spent the night in the main house. We invited them both to dinner letting them know beforehand that cheeseburgers were on the menu. It was the best I could do on short notice! Mimo really enjoyed the Comida Americana, but we weren’t’ so sure about Lopez. He ate it all, though! Tuesday morning, Lopez, Mimo, Eddie and I had a Tico breakfast of Gallo Pinto (rice and beans) and eggs at a local soda…$10 for the four of us. Then the builder met up with us and we looked at several of his completed houses and met one of his clients. He comes with excellent references. Later on, he looked at our house plans and it will be interesting to see the price of his bid. Yesterday morning, we visited another beach very close by and it was even more beautiful than the other one! Playa LInda was absolutely gorgeous and best of all, there wasn’t anyone around! 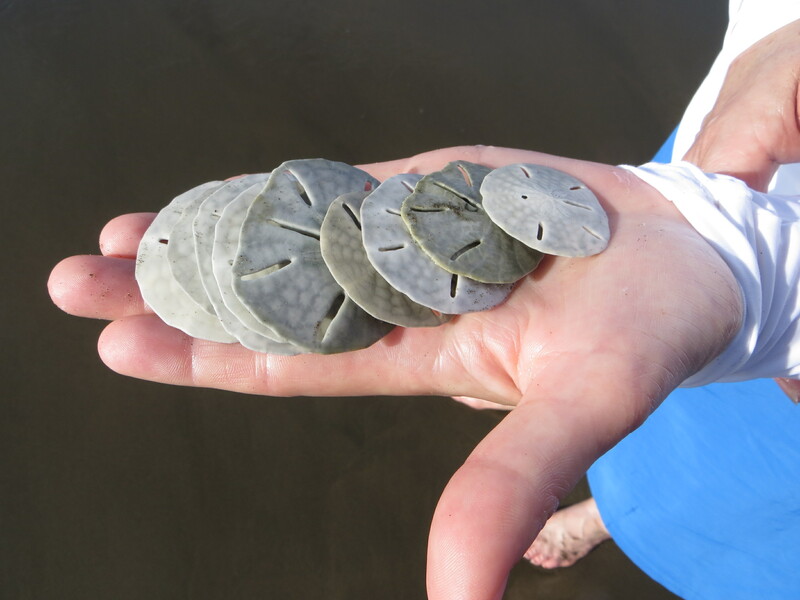 We found an abundance of sand dollars on the beach – some dead, some almost dead and a few very much alive. 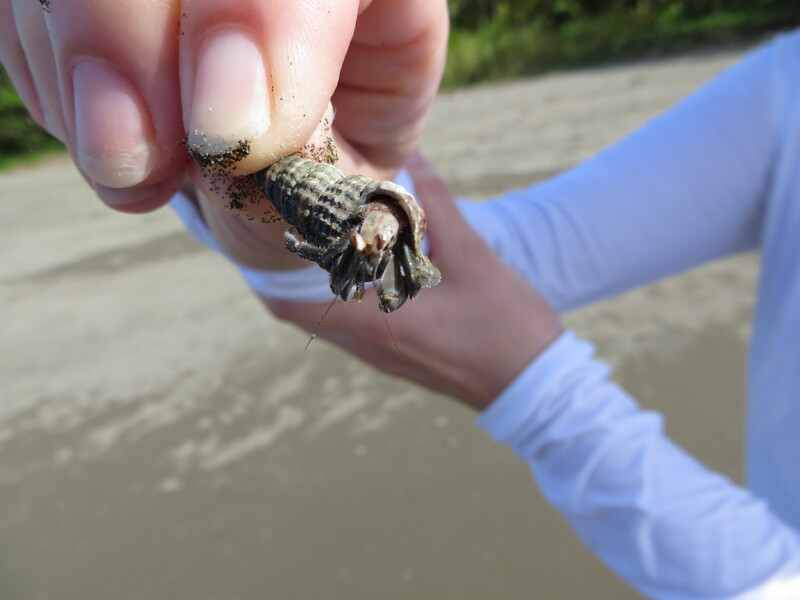 The live ones we threw back into the ocean hoping they would survive. The others, we picked up. I’m going to try to bleach them in the sun. 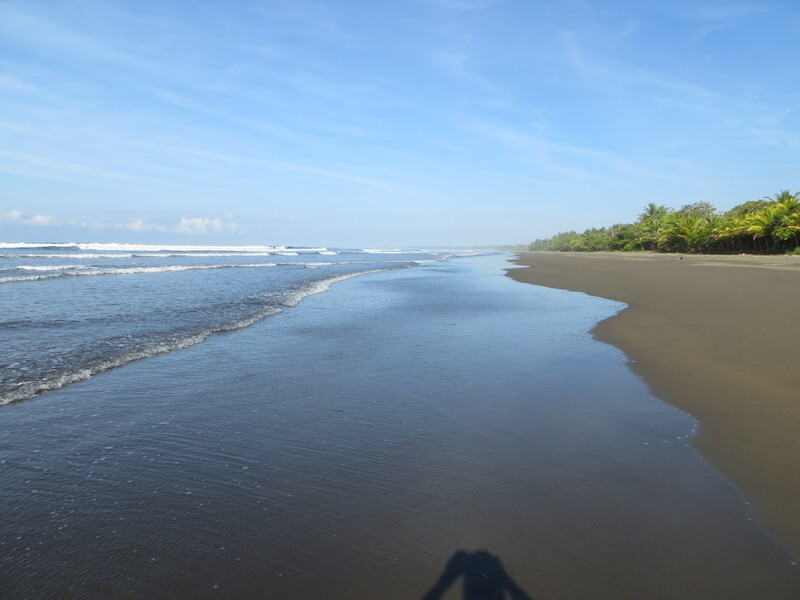 Playa Linda – truly a beautiful beach! 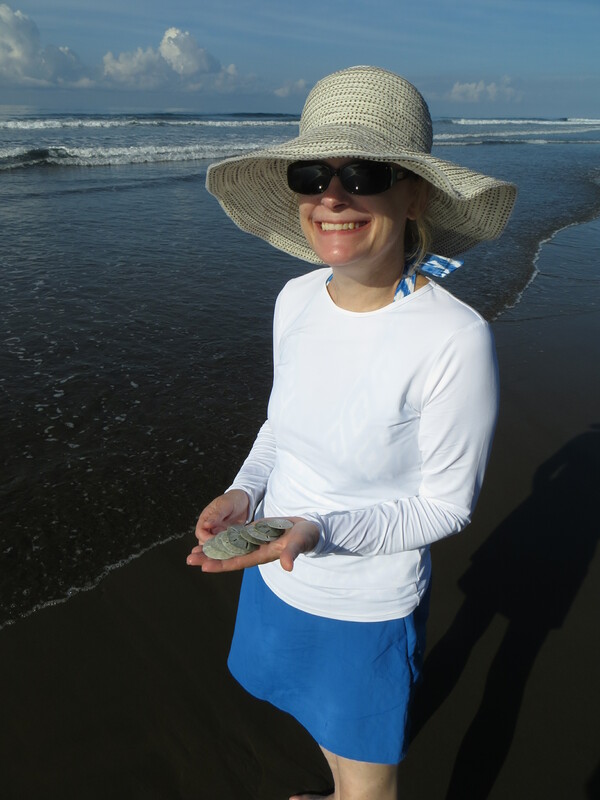 Ellen thought she found an empty shell for her collection – until the hermit crab popped out. Today we drove to San Isidro de General, which is about an hour drive away. 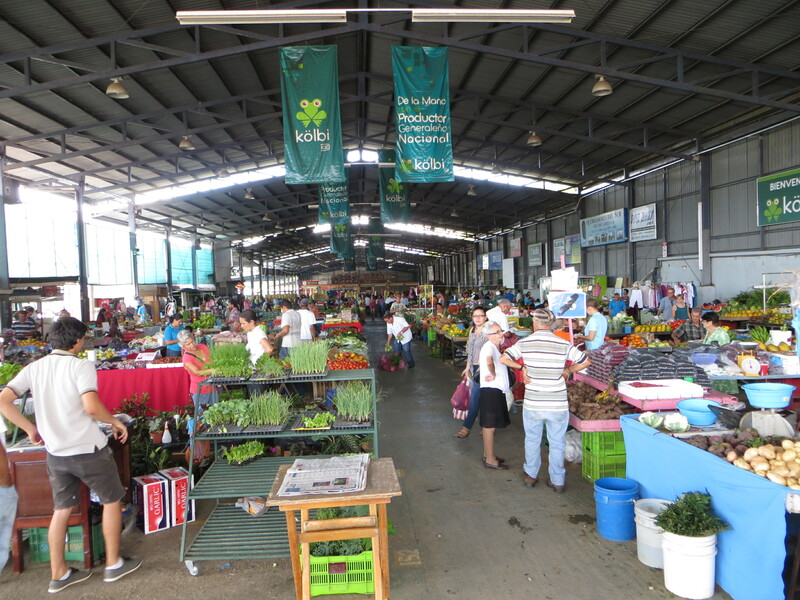 There is a farmer’s market (Feria in Spanish) every Thursday. There we found booth after booth of fruits and vegetables all fresh and inexpensive. We loaded up our cooler! We also went to a store that sells kitchenware, plastic storage bins and other household goods for very reasonable prices…except for baking pans from the U.S. I splurged and bought one cookie sheet for $12, which is why I only bought one! Some of the things we bought included a bucket, mop, plastic shelves for the closet and under the bathroom sink for a little more storage for toiletries. We needed more drinking glasses, too. All in all, we did well! I must stay that it’s very time consuming to clean up all those fruits and veggies. I put them in a Clorox bath and depending on the fruit or veggie, it’s anywhere from 15 to 30 minutes to soak, then 10 minutes in clean water and then rinsing, drying and storing. However, it’s all worth it as I don’t want to be as sick as I was earlier in our stay here. So far, so good!